Blogger Barhop 3 cheers at final stop 10 Pound in Beverly Hills. I don’t know if rich folk ever deign to go on barhops but if they do I have no doubt theirs would resemble Blogger Barhop 3 (BBH3): Stoli Elit High-Roller Edition aka “The Whale Tour” last Tuesday. 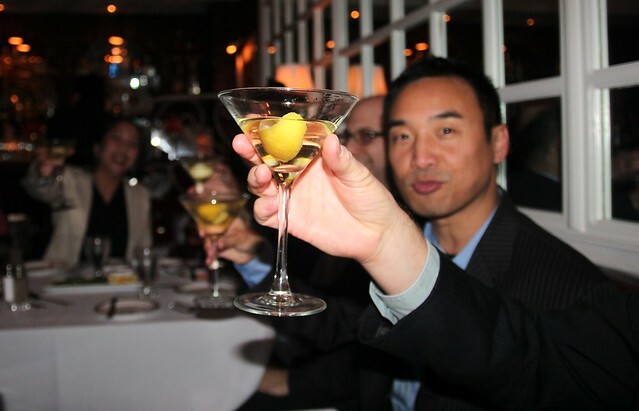 Unlike the previous blogger barhops — 2011 and 2012 — this one wasn’t sponsored by Plymouth Gin but by Stoli Elit vodka with LA ambassador and Neat bar owner Aidan Demarest (@elitinLA) serving as our guide around his favorite stops in Beverly Hills. He’s gotten wayyy fancier over the years. Because of the nature of this tour, we cut down our blogger participants as well as our stops considerably (previous hops were five and nine stops), and that way we could luxuriate at each location and wouldn’t have to rely on a Trolley of Death (BBH1) or Moustache Ride (BBH2) to take us from bar to bar. We merely hoofed it from La Dolce Vita to Spago to Scarpetta and then upstairs to 10 Pound. 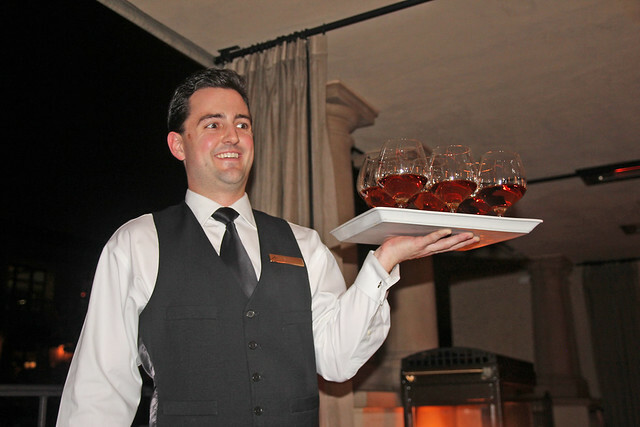 Fewer stops didn’t mean less cocktails, however, thanks to the cocktail-paired eight-course dinner at Scarpetta. In any case, the night was a nice peek at what the good life must feel like for barhopping whales. Even better than the Macallan tour. All of us in our cocktail attire, getting five-star treatment, sipping on high-quality booze, being shown the best seats in the house, and even rubbing elbows with celebs. For this oh-so-special tour we had limited seating, namely because of the dinner at the chef’s table at Scarpetta, so I had to pick a small group of bloggers for the excursion. Definitely made it easier to wrangle and get us to our next stops in a nearly timely manner. 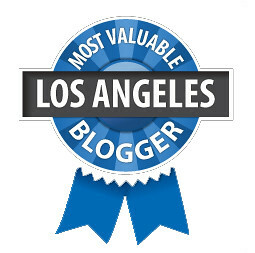 This year’s participants were @BusyBethsBlog, @estarLA, @JessicaGelt (LA Times), @JulianMStern (Maxim Magazine), @SavoryHunter, @ThirstyinLA and @WanderlushDiary (Societe Perrier). Here’s the tour, including some of my favorite Tweets from the night. La Dolce Vita’s Amanda pouring out the Vespers. The first stop was La Dolce Vita, a beautiful Italian restaurant which was the favorite of Frank Sinatra back in the day. For our hop, they actually sat us in his booth, a catbird seat across the bar but in a corner facing the entrance and the dining room. 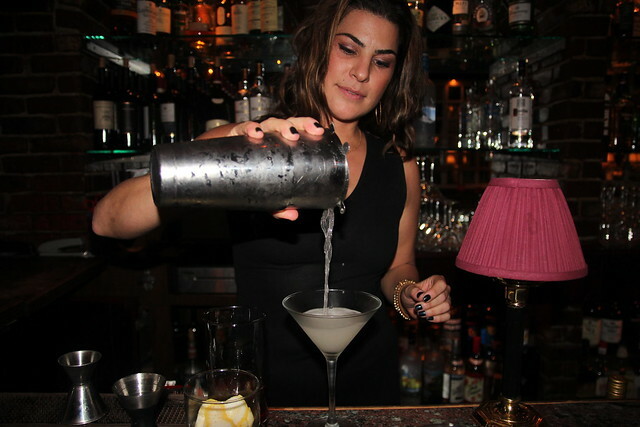 Bartender Amanda Gunderson greeted us with Vespers made with Stoli Elit (of course), Ford’s Gin and Lillet. A beautiful way to ease us into this night of drinking. For bites everyone feasted on lobster claws and mozzarella fritters. Cheers #3 at La Dolce Vita. We toasted a lot. 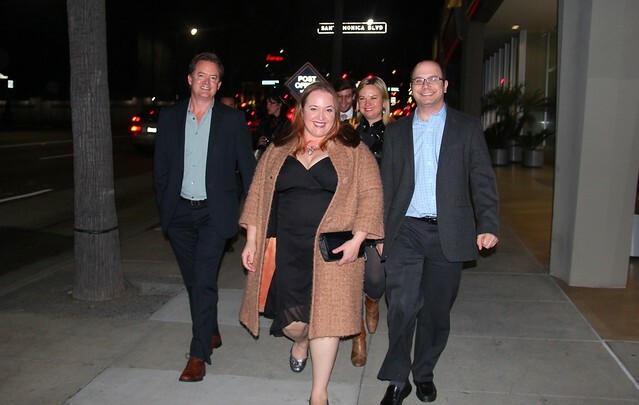 We waited til the rest of our party arrived but then had to rush off so we wouldn’t be late for our dinner at Scarpetta. Just as we were about to leave, a scruffy Sean Penn walks in through the door. He moved through our exiting group at the entrance, grimacing a bit. Well, maybe he wasn’t really grimacing, but I always feel bad for celebrities, never knowing if someone is just going to jump at them for a photo. We let him go by unmolested. One of the concerns for this hop at these celeb-frequented establishments was that we would be taking pictures of any famous people we’d run into. But I assured Aidan that we bloggers cared more about taking pictures of the food and cocktails than any A-lister. A celeb chef on the other hand? All bets are off. A short walk to Spago. Spago’s Wolfgang Puck sits down and chats with the blogger barhoppers. At the redone Spago, they sat us in the chic lounge area between the main dining room and the patio. It was gorgeous and we were right in the middle of the action. Now I really felt fancy holding court in the booth with Esther, Jessica, Beth and Aaron. Suddenly Chef Wolfgang Puck sits down at our booth and chats us up. I forgot what he said, I was too busy trying to not act starstruck. But he did tell Aaron he was lucky for sitting with a bunch of ladies. Everyone asked him to pose for pictures while I buried my nose in a huge goblet of Garden of Eden cocktail made with tea-infused Stoli Elit and lemon. 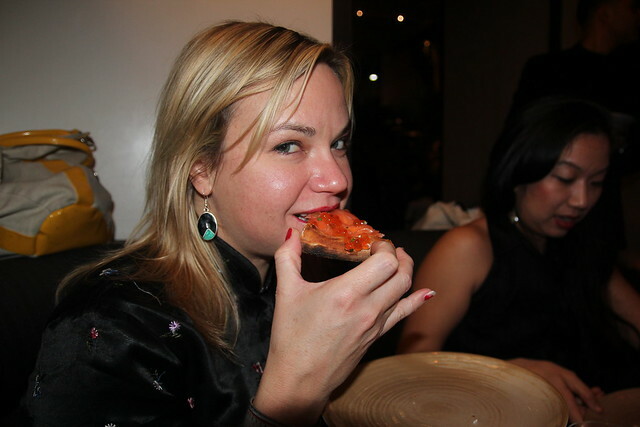 Jessica enjoying the salmon pizza at Spago. Then they delivered Wolfie’s famous off-the-menu salmon pizza to our table as well as ahi tuna cones. Since I’m currently a chegan (cheating vegan) I had to sit this one out. Sad trombone. But everyone seemed to love the food. As we were all standing up to leave, Rod Stewart and his very tall arm candy breezed in past us. Again, no pictures, but you know how we roll: Tweeted it. We all wanted to stay longer, so charmed by the surroundings, but were already so late to our Scarpetta dinner. 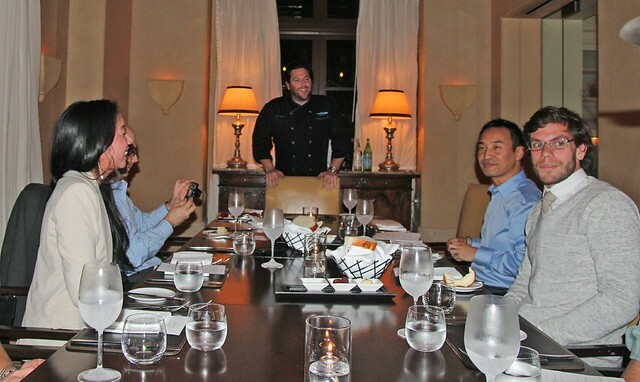 Scarpetta’s Chef Table with Chef Scott Conant. Then we had to rush across the street to Scarpetta at the Montage. Aidan had booked us the chef’s table off the kitchen for an eight-course dinner with a cocktail pairing. There we were afforded a premium view of the kitchen, which, although accessible during the weekend brunch is closed off to the main dining room folk. During this exclusive dinner Scarpetta chef Scott Conant stopped by to introduce us to the courses while bartender Sofia Szabo presented us with cocktails she created to go with each course. My personal favorites were the frozen Stoli Elit served with “pomegranate caviar” and the Autumn Orchard apple cocktail. As for the food I wish they gave me a giant heaping of that spaghetti. It was paired with a martini called “La Sudicia” (aka Dirty Girl) made with Stoli Elit, tomato water and muddled basil. I definitely have to come back for that perfect pasta and sauce. Don’t care if it is $24. Since I was eating off the vegetarian menu, I also got to try the sunchoke soup with onion marmalade, black trumpet mushrooms and parmigiano frico. Everything was excellent and I didn’t feel bad that I had to forgo the duck and fish for my veggie dishes. The dessert trio was paired with a chocolate hazelnut martini made with Nocello, Godiva Dark Chocolate, Stoli Elit, Van Gogh Chocolate Vodka and rimmed with candied pralines. Yeah, a bit too sweet to go with the dessert but considering the bartender only had three hours before the dinner to create the cocktails, it was a good show. Autumn Orchard: Stoli Elit, applejack, apple juice, Baked Apple Bitters, lemon, simple, egg white. 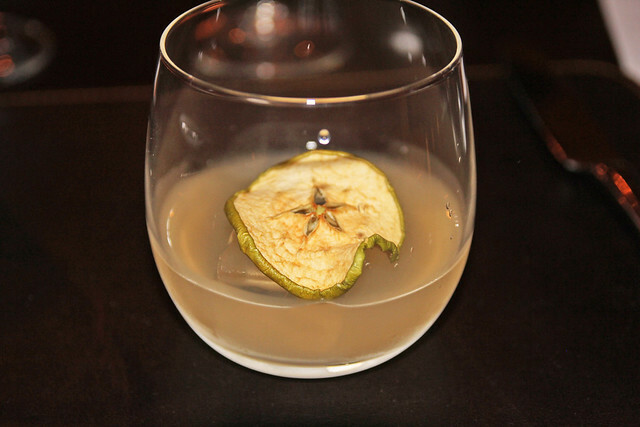 One large rock and dehydrated apple soaked in Zacapa XO to garnish. 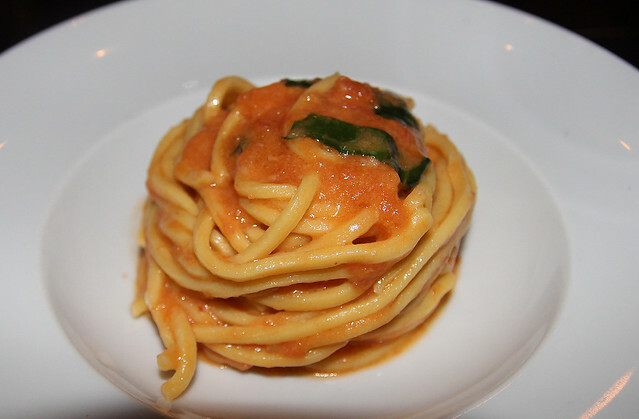 Scarpetta’s Spaghetti with tomato and basil. My FAVORITE! More toasting at last stop 10 Pound. Nope, that’s not water. 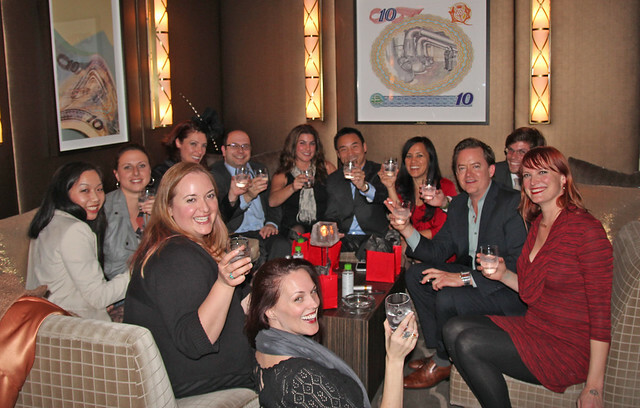 Last stop of the night was at the reservations-only 10 Pound Macallan bar, located on the mezzanine over Scarpetta. We toasted with more Stoli Elit but then eventually veered off the vodka path to 50-year-old Cognac and Macallan 12-year which everyone enjoyed with the bacon and cheese snacks. And later I vaguely remember our bartender Nick making cocktails with Bulleit bourbon and rye but my eyes could not stay open. The cigars, booze and 1:30 am time were taking their toll. Very disappointing considering we had planned a “Going Deep” after-hours portion of the tour. There was talk of Jumbo’s Clown Room. 10 Pound’s Nick is excited to bring us cognac. Ah well. Aidan sent us home in cabs with a goody bag containing his favorite hangover remedies like milk thistle, detox tea, coconut water, Advil, of course an Stoli Elit mini and a cigar(?). This was truly an epic night and I just don’t see how we can top it next year. San Diego? Vegas maybe? It’ll be fun to try.